Hi guys, hope you’re having a great Sunday! First of all, what? how is this even related to books? Well, it isn’t. In fact, this is the first installment in a new ‘series’ I’m starting on this blog, which is “Something Different Sunday”. Because, as much as I love books and everything to do with it, I also love a lot of other things. And while I’ve been in a slight blogging slump lately, I noticed that I did enjoy working on posts such as the Anything But Books Tag and my Top Fandoms. So I decided to open up my blog just a little bit to things other than books and like that, “Something Different Sunday” was born! Basically, this is the time for me to talk about non-book related things I enjoy, such as music, movies, TV or just discuss or rant about general topics that are on my mind. I know not everybody’s here for that, but don’t worry, there will still be plenty of book-related stuff here as well! But for today, let’s talk K-pop! I’m a Kpop newbie. I fell in love with K-pop about 2 months ago and since then, my playlist has been 95% Korean. Seriously, my husband is shocked when he hears English coming through my speakers. But even if I’m still a newbie, I am in love. It’s a style of pop that is super fun, catchy, visual and danceable. And even though I usually lean towards rock music, I also just simply enjoy most kinds of music and this K-pop category has now drawn my eye (well, ear). I wanted to talk about it, and maybe help others find something they enjoy in K-pop. So this is a post for newbies, from a newbie. K-pop has been steadily taking over the world. It is increasingly making appearances on Western charts such as Billboard. The development of online social media has been a vital tool for the Korean music industry in reaching a wider audience. But somehow, I feel like this doesn’t really include Europe? I mean, I get the impression that K-pop is already getting quite big throughout Asia, Australia and America, but not yet in Europe. Obviously, we all know Psy and his Gangnam Style, but that’s it. And there is so much more out there. 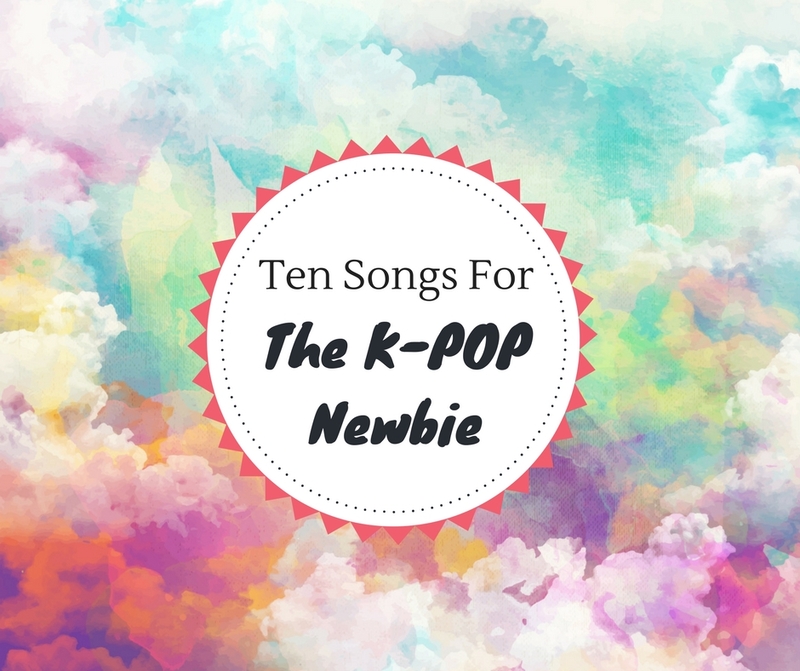 So here is a selection of ten songs that got me into K-pop. This is a combination of popularity (as in, which are the biggest hits, the most popular K-pop songs), and my own personal preference. (as in, which songs do I like best). So let’s go! Bigbang is HANDS DOWN my favorite K-pop band. Nicknamed “The Kings of Pop”, their songs are a mix of dance-pop and R&B. The quintet (including members G-Dragon, Taeyang, T.O.P., Daesung and Seungri) are already around for 10 years and have scored multiple hits. Other than as a band, they also have some great solo careers. Fantastic Baby was released in 2012 and is their most popular song, but definitely also listen to songs such as Bang Bang Bang, Haru Haru, Fxxk It, Last Dance, Loser, Blue, We Like 2 Party and Monster. South Korean girl group 2NE1 (pronounced as twenty-one) made electronic, dance-oriented pop music with a heavy R&B and hip-hop influence. Unfortunately they disbanded last year, but their songs are still amazing and the members are pursuing solo careers so there is still more great music to come! I Am The Best is their most iconic song and will have you chanting “Naega jeil jal naga” in no time. But of course, you can also check out their other hits, such as Come Back Home, Fire, Gotta Be You and Goodbye. Boy Band BTS (Bangtan Boys or Bulletproof Boy Scouts in Korean) blend dance-oriented K-pop with hip-hop influences. The seven members produce, compose and write their own lyrics and are slowly getting international fame, as they have also been nominated for a Billboard award. I personally love them for their music of course, but also their amazing dance skills and choreographies. Also, they are very present on social media and post a lot of behind-the-scenes footage and they are just hilarious. Besides Dope, also check out: Fire, Spring Day, Save Me, Not Today, I Need U, Run, Boy in Luv and Blood, Sweat and Tears. Xia, or Junsu, is definitely the most underrated artist on this list. He’s a South Korean singer-songwriter, dancer and stage artist. He is a member of the Korean pop group JYJ, and was one of the original members of boy band TVXQ. He’s also the first South Korean artist I ever discovered, thanks to his role as L in the Death Note musical. My personal favorite song by him is Flower, which is just visually and lyrically stunning. But other highlights include Incredible, Tarantallegra, Uncommited, Rock The World and OeO. The newest band on this list, K-pop girl quartet BlackPink made their breakthrough in 2016 and have a hip-hop and trap-influenced brand of energetic dance pop. South Korean boy band SHINee were one of the country’s biggest pop acts of the late 2000s and 2010s. With their high-energy, bass-heavy, electronic dance-pop and complex, tightly choreographed dance moves, they regularly topped the charts. EXO was formed in 2011 and make melodic, dance-oriented pop music. The band consists of 12 members divided into two subgroups, EXO-K and EXO-M. Although they record the same music, EXO-K focus on playing in South Korea and EXO-M specialize in performing in China for a largely Mandarin-speaking audience. EXID (Short for Exceed in Dreaming) is a South Korean girl group formed in 2012. The group consists of 5 members and gained success with their single Up & Down. Other than Up & Down, also check out Ah Yeah. Let’s slow it down a bit! Taeyang (born Dong Young-Bae) is one of the members of BIGBANG who has branched out into acting, modeling and a fruitful solo career. His hip-hop flavored pop solo album Rise not only topped the charts in South Korea, but also broke through on the American charts. And another BIGBANG member to finish this list. (Can you tell I love these guys?). But seriously, this list is not complete without G-Dragon (born Kwon Ji-Yong), leader of BIGBANG, rapper, singer song-writer, producer and fashion icon. He also has huge international success, going on a huge world-tour in 2017 (unfortunately not including Europe ). That’s it! Of course this is only a super small selection of everything Kpop has to offer, but it’s a great start and I’m sure it’ll be able to give you an idea. Are you familiar with K-pop and if so, are you a fan? Do you have any favorites that K-pop newbies should definitely check out? Or are you like me 2 months ago, completely new to K-pop? Do you think it’s something you could like? My sister went through a bit of K-Pop phase so I’m a little familiar with it. Can’t say it’s really my thing though ? but I totally appreciate the effort and hard work that goes into it. Everything I’ve seen is super creative. I’m am so so excited for this new feature though 😀 Can’t wait to see more! !